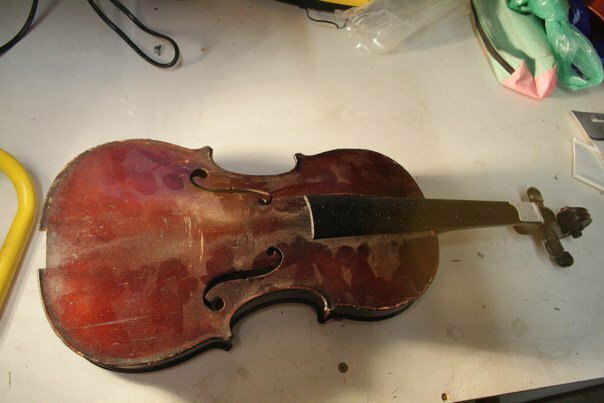 With the violin complete all that is left is to string the instrument and tune it up. It will develop more tone with time and playing, but I’m very pleased with the sound. 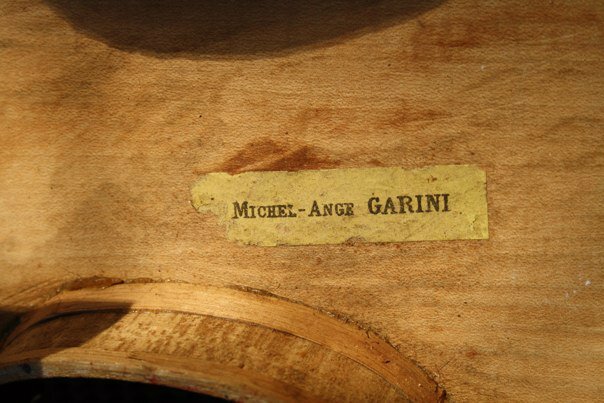 This is a fine 3/4 size Michel-Ange GARINI made in the Vosges Mirecourt region of France for the workshop of Jerome Thibouville-Lamy (JTL) in the early part of the 20th century – probably around 1903-5. So it’s been quite a learning journey for me, and worth every step and mis-step. Still a fair bit if work here – new sound-post, new end button, new pegs – shaped and fitted – nut shimmed and re-glued, saddle refitted, new bridge cut, and new strings fitted. Now for the soundpost. itting the soundpost. 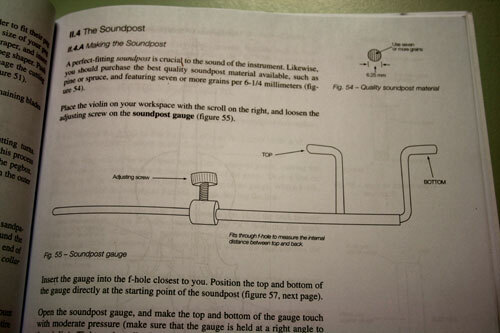 By tying two threads to the soundpost, with one leading out through each F-hole, the soundpost can be guided into position and nudged into place with the soundpost setting tool. 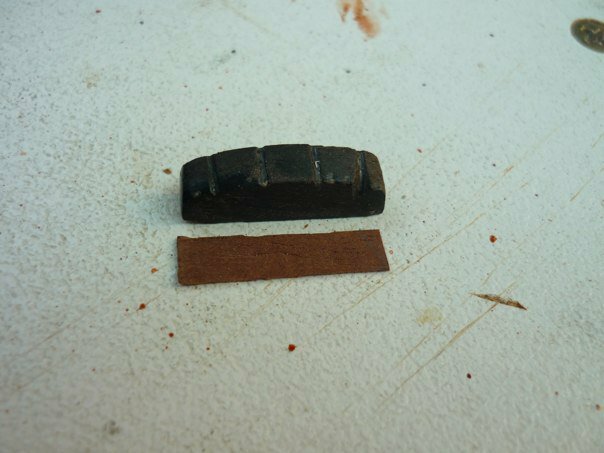 The threads allow for rapid retrieval when the post falls out of place. The end-button was not yet fitted, enabling a good visual sighting to ensure the sound post was vertical in length and breadth. 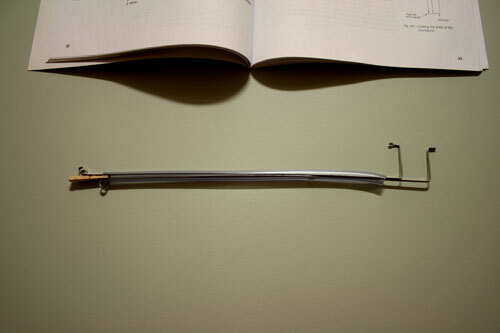 The soundpost was cut to length after using a soundpost gauge to determine the length, and was shaped at each end to fit the curvature of the instrument. 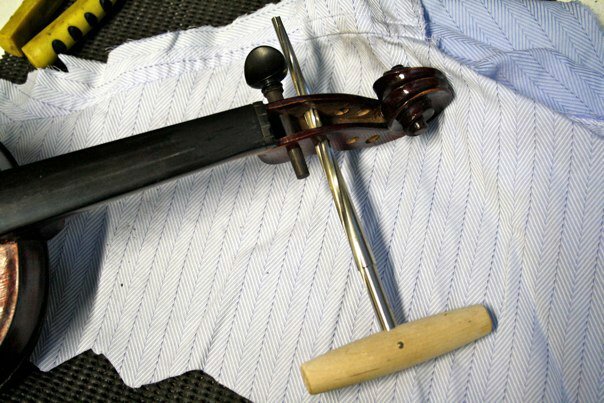 Then the peg holes were lightly reamed to the correct taper, the pegs were tapered in a shaper – which is like a large pencil sharpener, then the pegs were cut to length and fitted to the peg box. Then with a pencil I marked the position of the string holes, then removed the pegs and drilled them with a 1.5mm drill and countersunk each end of the hole with a round file. 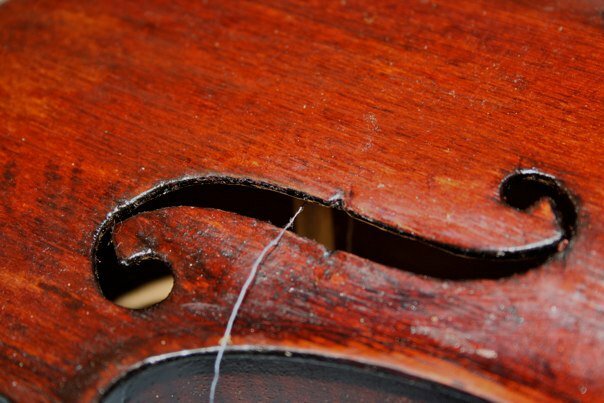 It occurred to me that once the top is on the violin, I will need to make a new sound post as the repair will have slightly changed the profile of the interior. 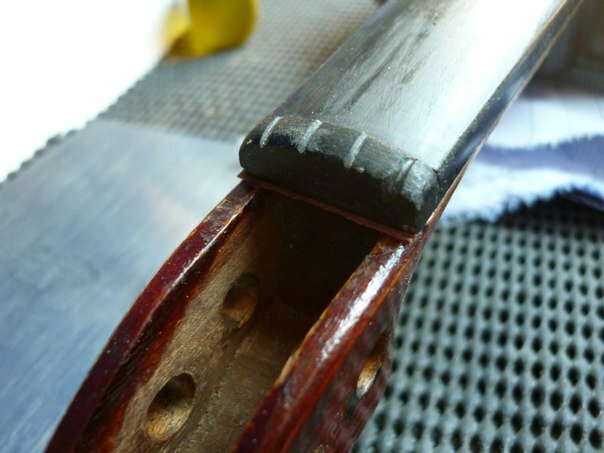 There are two ways to ensure the correct length of sound post: firstly, you can guess and risk wasting precious sound-post timber, or you can measure the space and cut to size. You see, the spine of the old wiper blades consisted of two thin strips of mild steel about 1 mm thick and 3 mm wide and about 300mm long. I decided to get dangerous with a pair of pliers. 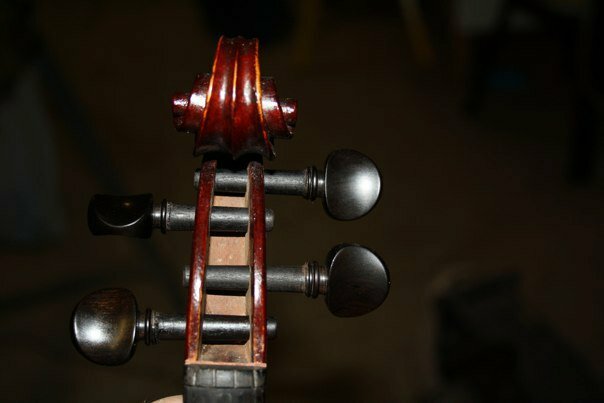 Once I bent the two pieces so they would nestle into each other with opposing ends (already rounded so they won’t scratch the violin timber) I found a piece of clear plastic tubing (fuel line) – although you could use a drinking straw – and bound the two strips together with the tube, and then bent the ends over so they would be easy to grasp and slide the two pieces against each other to make the measurement. 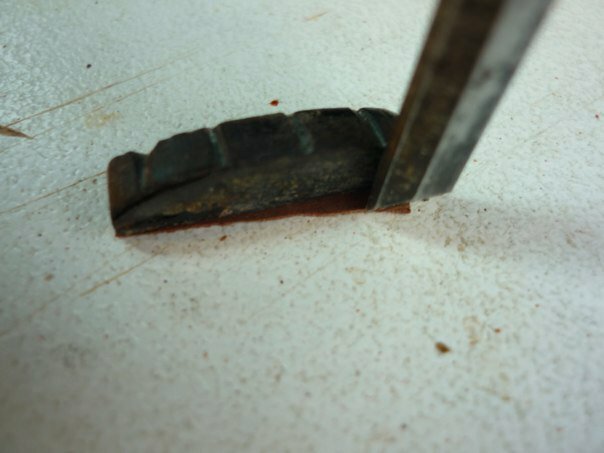 I also inserted a small timber wedge from an offcut so as to provide a good friction fit that would retain the measurement while extracting the tool from the F-hole. And here is the result – a functional sound-post gauge. I ordered and received some spruce 3mm sheets – perfect for making repair cleats. 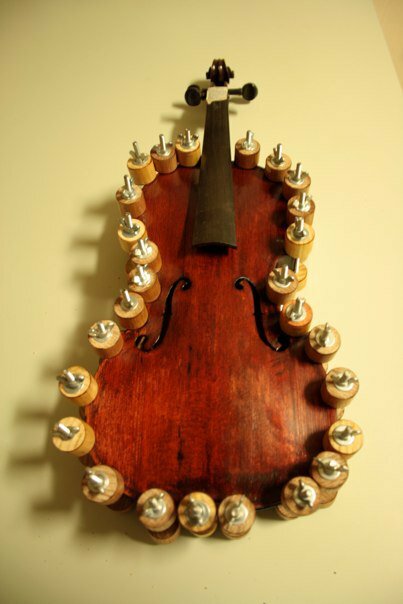 There is probably enough to last me for a lifetime of violin repairs! 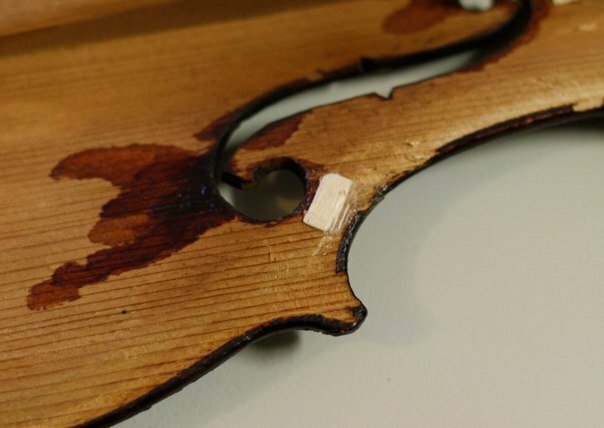 The extensive cracks on the violin top certainly required reinforcement. I cut a series of 5mm squares and lightly sanded them to fit the curve of the inside top plate and glued them in place along the largest cracks with hide glue. Then I shaved each of them down to a low pyramid. 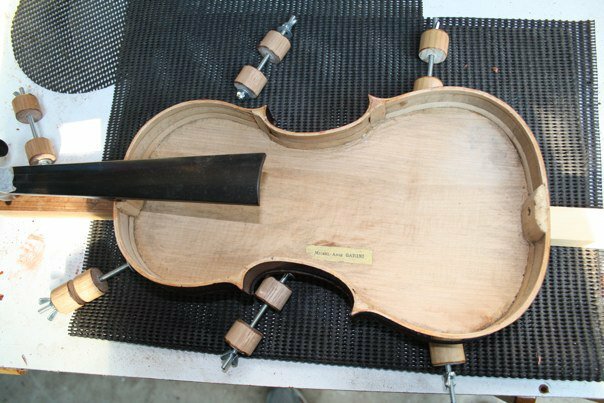 This process took a couple of hours as I needed to get each one in place and clamped and set, then when the glue was set, I began shaving them down with a very sharp chisel. 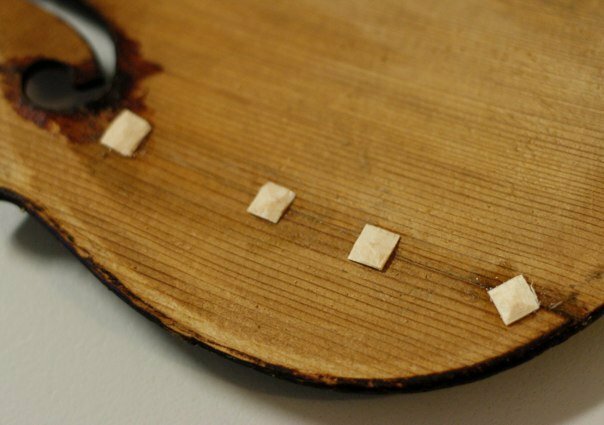 This last one is a little different, and is known as an ‘eyebrow patch’ which involves removing some of the original timber and inserting a piece of spruce and carefully shaving it down to be flush with the surrounding wood. 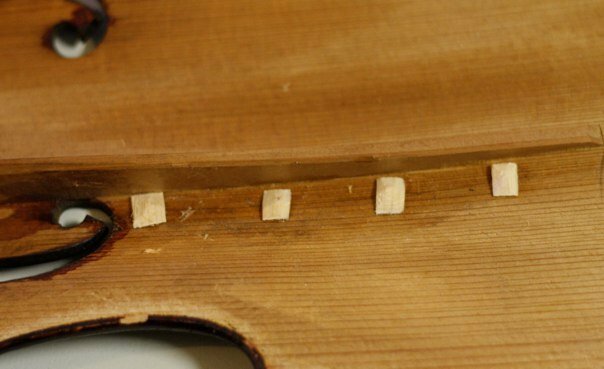 This makes for a strong repair, and as it is still spruce – the same as the rest of the top, there should be little impact on the sound. It is the strongest way to repair an F-hole failure. 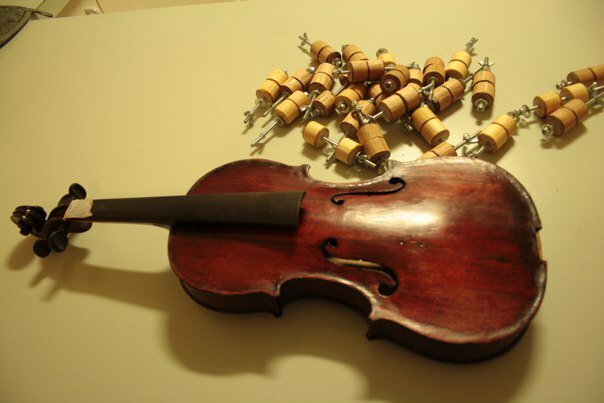 With the violin apart I realised that I only had half enough spool clamps – so before proceeding with the repair I made another 15 clamps bringing the total to 30 – which should be more than enough to reassemble the violin. First get some threaded rod – I used 3/16″ whitworth – as that was standard at Bunnings®. I also bought nyloc® nuts, washers (double the quantity of the nuts) and wingnuts. 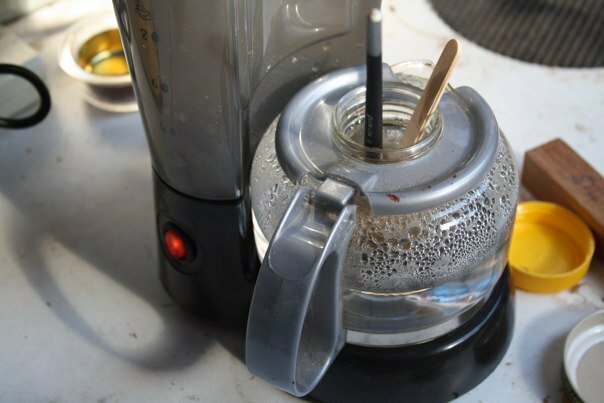 I also had some 1″ dowel – like the sort used for broom handles. 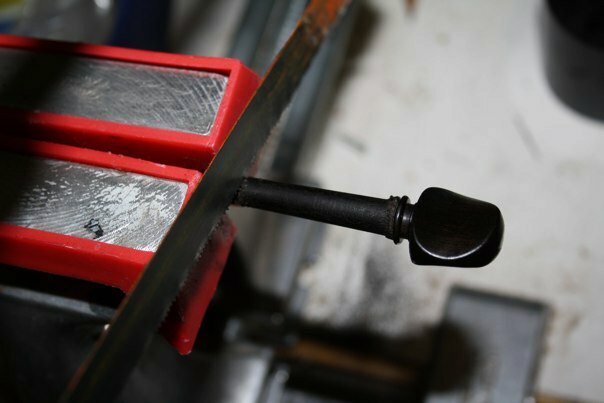 Next I smoothed the ends on the grinder – you can use a file – this will take the sharp edges off the ends. Just rotate so you have a light chamfer on the ends. Next I cut the dowel into approximately 1.5-2.0 cm (about 1/2″) slices – two per clamp. Now drill a centred hole through each pair of dowel rounds to fit as a close but sliding fit over teh threaded rod sections. Now take the threaded rod and add one nyloc nut to one end. 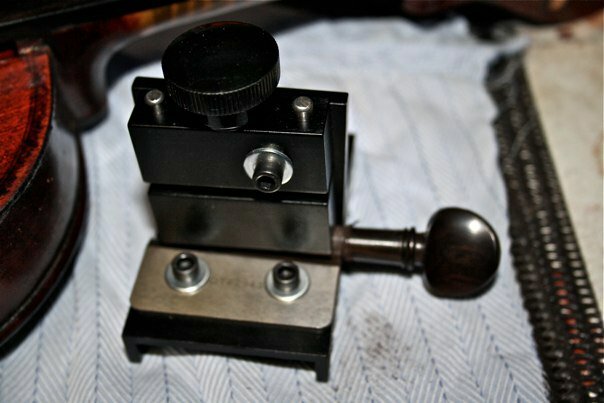 Using the wrench, make sure the nyloc nut is on tight so that the ed of the threaded rod just emerges through the nut. Then add a washer. And you can add that clamp to all the ones you made earlier! Total cost was about AU$16.00 – making them actually less than AU$1.00 per clamp because I have enough material left over to make several more.